Two North Twentieth sign (originally the BTNB signboard) is a monumental electric sign on the roof of the Two North Twentieth at Morris Avenue between 19th and 20th Street North in downtown Birmingham. The 176 long by 26 foot tall double-sided sign sits atop the 17-story modernist-style skyscraper which was designed by architect Lawrence Whitten for Engel Realty. It was installed on the rooftop for the Centennial of Birmingham in 1971, nearly a decade after the building was completed in 1962. Though the building's primary tenant was the Bank For Savings, the sign was sponsored by rival Birmingham Trust National Bank. BTNB employee Patricia Vance operated the electronically-controlled array of 1,330 incandescent lamps. The display was visible throughout downtown and Southside. 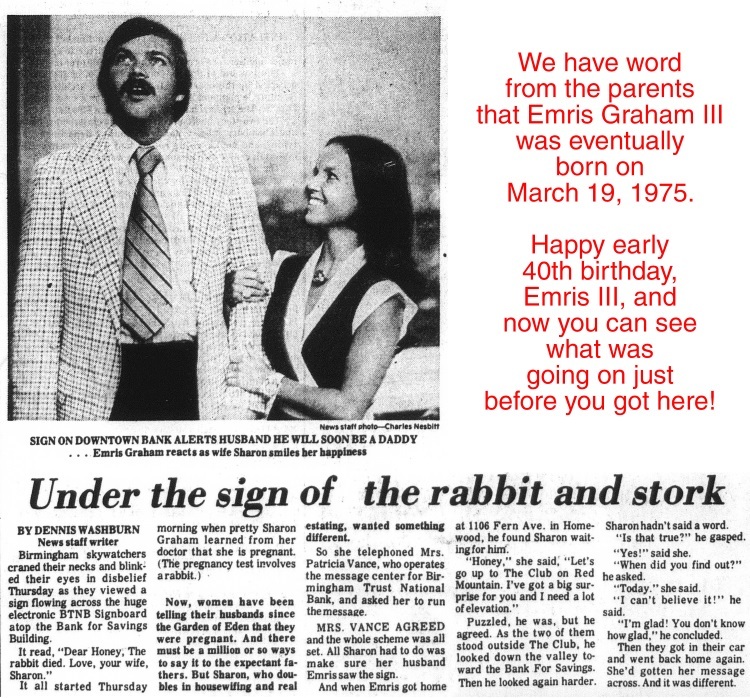 Sharon Graham used the sign in August 1974 to inform her husband, Emris, that she was expecting a baby. The scrolling message read "Dear Honey, The rabbit died. Love, your wife, Sharon." Aging of the sign's components led to it going dark in 1988. In 1996 Skyline Advertising purchased and refurbished the rooftop sign, but their venture lasted for only a year. In 1999 the building was purchased by Atlanta developer George Cornwell, who oversaw a $16 million renovation, renamed "Two North Twentieth". In 2001 the advertising marquee was once again re-lit. Harbert Realty Services took over management of the building and ownership of the sign. The building was sold in 2013 to PZZ TNT Property Owner LLC of New York. Harbert Realty retained ownership of the rooftop sign. In June of that year, Harbert and Buffalo Rock proposed covering the sign with a vinyl billboard for Pepsi-Cola. They presented the proposal to the Birmingham Design Review Board, which objected to the idea of installing a "glorified billboard" in place of the well-known scrolling marquee. The Birmingham sign ordinance, as amended in 1989, prohibits the construction of new billboards in the city. Harbert claimed that the sign was costing them $500 a month to maintain and that the covering would be temporary, until the company was "ready to spend" $4 million or more on a completely digital upgrade. Harbert returned to Design Review in July with a modified proposal developed with Pepsi and O2 Ideas which read "Birmingham: The City with Great Taste" alongside a smaller Pepsi logo. When that proposal was also rejected, Harbert's representative, Tab Bisignani, openly questioned the board's authority to prevent them from carrying out their proposal. According to Bisignani, an official with the Birmingham Department of Planning, Engineering and Permits said that because the overall dimensions of the sign would not be changed, a permit was not required. Department of Planning Engineering and Permits deputy director Edwin Revell replied that Harbert misunderstood, and that, “[w]hile there is not a permit requirement associated with wrapping the sign, this structure/property is located in a design review district with restrictions for signs as it relates to advertisement," and restated the city's position that approval from the Design Review Board was required. Harbert ignored that interpretation, and began installing a vinyl sign reading "Pepsi: A Southern Original" in February 2014. They also added flood lights to illuminate the new billboard. Mayor William Bell's Chief of Staff, Chuck Faush, acknowledged that since the project did not require a permit, there was no mechanism in place to enforce the authority of the Design Review Board. Completion of the new sign was celebrated by Buffalo Rock with a party on the roof of the Kress Building on Monday, March 3. CEO Jimmy Lee III enthused that the new sign "definitely looks better than that rusted can that was up there." The party featured hostesses clad in dresses made from Pepsi, Grapico and Buffalo Rock Ginger Ale packaging. In early 2015, Harbert Realty sold the sign to 84 Outdoor (now Transformation Media), a billboard company based in Bentleyville, Pennsylvania. In March 2016 it was announced that the Pepsi sign was to be replaced by a billboard promoting UAB and its relationship with the city, for which the university was to pay $300,000 for a one-year lease. Cayenne Creative collaborated with UAB on a design incorporating well-loved Birmingham landmarks along with the UAB logo. The images included the tops of three skyscrapers (the John Hand Building, Wells Fargo Tower and City Federal Building), three iconic signs (the Alabama Theatre, Magic City sign, and Railroad Park), the Vulcan statue and the Sloss Furnaces water tower. Word of the proposal prompted Andre Bittas, director of the Birmingham Department of Planning, Engineering and Permits, to send a "cease and desist" letter, informing 84 Outdoor that it would need to seek approval of the sign from the Birmingham Design Review Board before his department could issue a "sign permit". The company met with members of the board informally on March 8 and again after the regularly-scheduled meeting on March 9 to discuss the proposal. At that time James Stanley, an assistant city attorney, told the committee that for zoning purposes the sign is considered an "existing non-conforming structure" and the proposal would not require their review unless it was significantly altered or reconstructed. The board did ask 84 Outdoor to return and present the design at their March 23 meeting for further review. Prior to that meeting, some members of the committee expressed hesitation to approve any design for a static sign covering the electronic message board, believing that it could set a precedent effectively transforming the display into a "grandfathered" billboard. At the meeting, 84 Outdoor attorney Alton Parker of Spain & Gillon told the committee that, "you have before you a grandfathered, legal, nonconforming sign over which you have no jurisdiction." The board went into executive session to discuss the matter and voted to disapprove of the proposed sign, saying that it was "an inappropriate solution to a historic sign." 84 Outdoor appealed the committee's decision to the Birmingham Department of Planning, Engineering and Permits' Construction Board of Adjustments and Appeals in July 2016. The Board upheld the committee's determination that a vinyl covering was a substantially different design than the existing electronic marquee. This page was last modified on 4 July 2017, at 20:46.